The following is the complete text of an email that I just sent to the Home Office'sPolice feedback webpage (with links and formatting added for context). Don't know if it'll have any effect, but it's worth a try — I'll post any replies that I get here. I was walking through Enfield today and saw one of the new Policing Pledge posters, specifically the "Anything You Say May Be Taken Down And Used As Evidence" one. Now, I fully support the idea of the Policing Pledge — I think it's a great idea to get the public involved in this way, and opening a dialogue with people can only be a good thing. However, this particular campaign could very quickly descend into a public relations nightmare, for the following reasons. First, selecting as your slogan a phrase which is only ever used when people are arrested is not exactly the best way to show that the police are on the side of the public. It immediately conjures up images of officers tackling people to the ground and snapping on the handcuffs, meaning that the very first impression that people take away is decidedly negative. Secondly, once that image is in someone's head, they will immediately interpret "Anything You Say May Be Taken Down And Used As Evidence" as "Shut up, we don't tolerate dissent around here". Why? Because many of those who see it are going to mentally tack on the words "Against You" to the end of the slogan — I know I did. Coming on the heels of the ludicrously paranoid anti-terror posters that have gone up, suggesting that terrorist attacks can be deterred by people snooping on their neighbours and rummaging through their bins, you're helping to create a public image of repression, not openness. Thirdly, using the style of the classic "Keep Calm And Carry On" poster is a very bad idea. If people were going to interpret your slogans as they were meant, then sure, it's a witty homage to the original poster. But given that a significant proportion of the public are going to interpret your intentions in the way I outlined above, it looks like you're co-opting something very laudable (dare I say, something deeply British) and turning it on its head, making its meaning "watch what you say and do, because we're after you". In the end, it looks like a sick parody of the original slogan, made by someone who read George Orwell's Nineteen Eighty-Four and thought "hey, these Thought Police guys have all the right ideas!" I'm yet to have any personal experience with the police that wasn't thoroughly professional, which made it all the more jolting when I saw this poster. The fact that I had to come as far as your website to find out that actually, it wasn't a campaign aimed at terrifying me into mindless obedience, shows that something has gone terribly wrong in your public relations unit. Please try to rectify this rapidly, as I am absolutely sure I'm not the only person who is going to see it like this. As I said, the Policing Pledge is a good thing — I'd hate to see it ruined by a misjudgment like this. One more bad thing: it's led to yet more tired overuse of1984references. Orwell must be rolling his grave. Let's be clear on a couple of points. Google undoubtedly has every right in the world to take photos in public spaces, and to make those photos freely available to anyone who wants to see them. It's a right that photographers have enjoyed pretty much since photography was invented, and it is an important part of our freedom of expression that we can photograph those things that some people would rather we not photograph. Inconvenient it may sometimes be, but that's part of the price of a free society. What's more, the technological advances that have made Street View possible are nothing short of stunning. Digital cameras have been around in some form since the '70s, GPS since the '90s, and 360-degree photographs since at least 1980. Yet all these elements only came together in 2007, when Google launched Street View in the States and allowed thousands of people to walk haltingly along rather pixelated virtual streets, gawking at their surroundings in a way that previously they could have done only by, well, actually going there. So Street View is undoubtedly a good thing in those respects. But — and this is important — although something might be legal, and although it might be cool, that does not necessarily make it a sensible thing to do. I can't believe I'm saying this, but Google may have something to learn from Facebook here. Facebook has the capability to simultaneously stir deep, virulent rage and fanatical loyalty within the hearts of its users. They may log in every day to tirelessly check their status, but change the layout by a single pixel and they will have no mercy. You'd have thought that the site's owners would notice this, but apparently not — back in 2006, they seemed genuinely surprised that their proud unveiling of the News Feed feature, which gathered data from all of a user's friends and presented it in a very information-rich format, was greeted with sheer horror by thousands of users. Facebook's response to the unprecedented amounts of bile pouring towards them was simply "But you put this information here in the first place! Why are you angry that people can see it?" On the face of it, that's not unreasonable. What they failed to take into account, though, was that the context in which that information had been put onto the site was very different to the context in which it was now being presented, perhaps to the point that users would not have entered that information had they known it would be broadcast to everyone they vaguely knew. It was an easy mistake to make, to be fair. Cultural standards are frequently illogical and inflexible — clothing styles that would be seen as modest on a Hawaiian beach would be taken as a sign of disgusting immorality in conservative Middle Eastern countries, for example — and on the Internet, cultures spring up, clash and meld at terrifying rates. Facebook's owners had spent years in an environment where they were dealing every day with tons of personal information, and they had lost sight of the value that their users put on it. In the same way, Google, caught up in their excitement at this Really Cool Thing, didn't realise that there are some things that people simply would not have done if they knew they'd be visible to anyone and everyone. That doesn't need to imply that these things are embarrassing or immoral in themselves — if I were, for instance, going out with someone but hadn't told anyone because I wasn't sure whether it would work out, I wouldn't necessarily want pictures of me at a romantic candlelit dinner being splashed onto the Internet where certain rather excitable members of my family could see them. (Yes, that example is entirely hypothetical. Calm down.) Privacy isn't something that is required only when you're doing something questionable, it's something that we can and should be able to expect at all times. It's not a new concept — if I may go all Scriptural for a second, Paul says in 1 Corinthians that "everything is permissible for me — but not everything is beneficial." Street View is immensely cool (hey, look, you can even see the bike racks we installed on the house in Oxford where I lived in 2007!) and it's also legal. It's just not necessarily a very good idea, and I really hope they can work out the kinks so that it can be another classic Google product: awesome, and only a tiny bit evil. Doughnuts are not included. De-boost. In our modern technologically-connected world — of which you're seeing evidence right now, seeing as this content is being delivered to you from Google's servers in LA, despite the fact that I wrote it in a flat in Enfield — information is the new currency. That's really not much of an exaggeration. Especially now that the economy is imploding spectacularly, any edge that a company can get over its rivals is going to be ruthlessly exploited. And if they can dress up such an edge as actually being for the benefit of their customers, all the better. Supermarket loyalty cards are a great example. These schemes started off as something of a white elephant for the supermarkets — although they're a big draw for customers, they cost a lot to keep going and probably offer little tangible benefit to the retailer (anyone who shops in a particular place often enough to want a loyalty card is unlikely to be regularly shopping elsewhere anyway) — but once one of them started offering the scheme, everyone else jumped on board in an attempt not to get left behind. That means that supermarkets have desperately floundered to make money out of it ever since, and one of the ways they can do that is to use the information they gather. Consider what information the supermarket has about you. If they know everything that you buy in their shops, they can estimate the size and composition of your family, your average alcohol consumption, your waistline (those pizzas add up), your social schedule (so how often are you buying multi-packs of Doritos?) and your general economic situation. And that means that they can, in theory, target their marketing very accurately. For example, if they work out that, statistically speaking, it's a likely week for you to buy ice-cream, they can draw your attention to the special offers they have on the expensive brands. If you haven't bought chocolate in the last three weeks, they might push Weight Watchers products. We almost certainly will never see the exact information held about us, although I suppose a Data Protection Act request might be interesting. There's one time when you get to see the conclusions drawn by the supermarket very clearly, though, and that's when they send you money-off vouchers. This is the most precise form of marketing that they can produce, so it'll always be the most information-rich time in your relationship with your local retailer. Obviously, I find this concept slightly creepy, but at the same time I'm an absolute sucker for finding out interesting stuff about myself. That's why I like last.fm, despite it having almost no practical use — being able to point to a summary ofeverything I've ever listened to when connected to their service is kind of fun, and tells me a lot about my music taste. 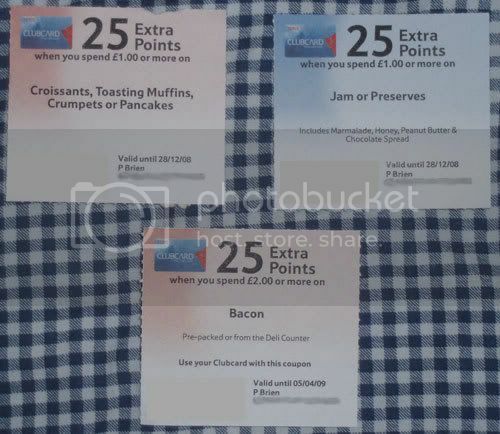 So I had a rather enjoyable little moment the other week, when I found some of the coupons Tesco had sent me in the past few months. Boy, do they know me.